Diabetes insipidus (DI) is an uncommon condition in which the kidneys are unable to prevent the excretion of water. During the day, your kidneys filter all your blood many times. Normally, most of the water is reabsorbed, and only a small amount of concentrated urine is excreted. DI occurs when the kidneys cannot concentrate the urine normally, and a large amount of dilute urine is excreted. The amount of water excreted in the urine is controlled by antidiuretic hormone (ADH). ADH is also called vasopressin. ADH is produced in a part of the brain called the hypothalamus. It is then stored and released from the pituitary gland. This is a small gland just below the base of the brain. Antidiuretic blood test measures the level of antidiuretic hormone (ADH) in blood. DI caused by a lack of ADH is called central diabetes insipidus. When DI is caused by a failure of the kidneys to respond to ADH, the condition is called nephrogenic diabetes insipidus. Nephrogenic means related to the kidney. Central diabetes insipidus is a rare condition that involves extreme thirst and excessive urination. Hypercalcemia means you have too much calcium in your blood. Excessive amount of urination means that your body makes larger than normal amounts of urine each day. The health care provider will ask about your medical history and symptoms. The sodium blood test measures the amount of sodium in the blood. Sodium can also be measured using a urine test. The cause of the underlying condition will be treated when possible. Central DI may be controlled with vasopressin (desmopressin, DDAVP). You take vasopressin as an injection, a nasal spray, or tablets. If nephrogenic DI is caused by medicine, stopping the medicine may help restore normal kidney function. But after many years of use of some medicines, such as lithium, nephrogenic DI can be permanent. Hereditary nephrogenic DI and lithium-induced nephrogenic DI are treated by drinking enough fluids to match urine output. Medicines that lower urine output also need to be taken. Nephrogenic DI is treated with anti-inflammatory medicines and diuretics (water pills). Outcome depends on the underlying disorder. If treated, DI does not cause severe problems or result in early death. If your body's thirst control is normal and you are able to drink enough fluids, there are no significant effects on body fluid or salt balance. Not drinking enough fluids can lead to dehydration and electrolyte imbalance, which can be very dangerous. If DI is treated with vasopressin and your body's thirst control is not normal, drinking more fluids than your body needs can also cause dangerous electrolyte imbalance. Call your provider if you develop symptoms of DI. If you have DI, contact your provider if frequent urination or extreme thirst returns. Hannon MJ, Thompson CJ. Vasopressin, diabetes insipidus, and the syndrome of inappropriate antidiuresis. In: Jameson JL, De Groot LJ, de Kretser DM, et al, eds. 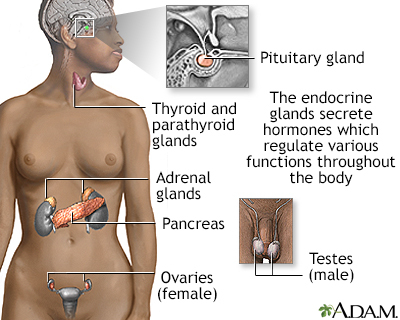 Endocrinology: Adult and Pediatric. 7th ed. Philadelphia, PA: Elsevier Saunders; 2016:chap 18. Verbalis JG. Disorders of water balance. In: Skorecki K, Chertow GM, Marsden PA, Taal MW, Yu ASL, eds. Brenner and Rector's The Kidney. 10th ed. Philadelphia, PA: Elsevier; 2016:chap 16.